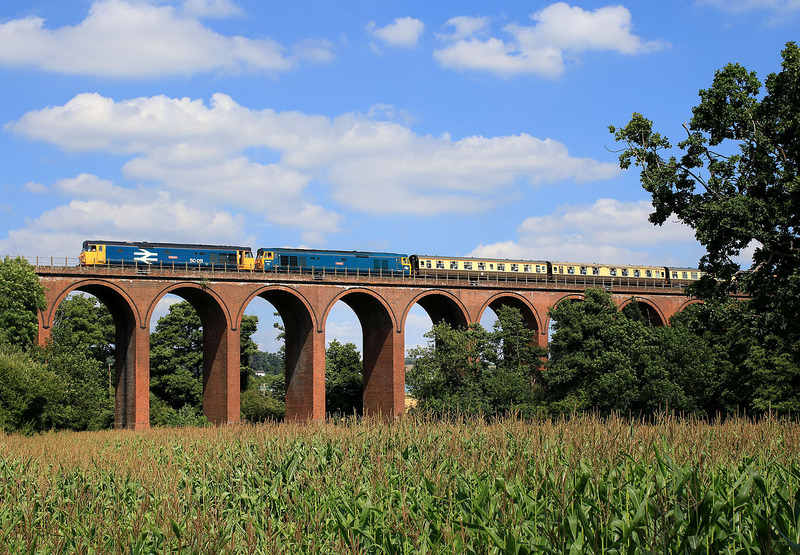 50049 Defiance & 50007 Hercules (masquerading on this side only as 50011 Centurion & 50006 Neptune respectively) cross Ledbury Viaduct on 5 August 2018 with the GBRf Charity Railtours 1Z50 12:14 Birmingham International to Birmingham International (via Hereford and Cheltenham) 'Dub & Grub' railtour. The sun was on the very edge of a cloud here, and although this is fully lit, by the time the rear of the train was crossing the viaduct, the whole of the maze field in the foreground was in shadow. A very close call!